The cast of Angel Reapers. Photo by Joan Marcus. BOTTOM LINE: A non-traditional, theatrical evocation of the early Shakers and their ecstatic spiritualism. You may only have a vague memory of hearing about the Shakers during an American history class long ago. Maybe, like me, you cannot quite remember why they were important or how, as a community, they were different than any other self-defined, small, isolated sect of Christians in early America. To experience Angel Reapers you need not know or remember a thing about the Shakers, and perhaps it is better if you don’t arrive with any preconceived notions. The product of a collaboration between Pulitzer Prize and Tony award winning playwright Alfred Uhry and MacArthur Fellow, director, and choreographer Martha Clarke, Angel Reapers was first performed in 2011. This production of Angel Reapers is a self-described “revisiting” of the original, a process which Clarke describes as adding text, music, and “splitting it open” in order to reassemble it anew. The performance is essentially an experience of you, as an outsider, seeing a community split open and present in all its beauty and in all its ugliness. 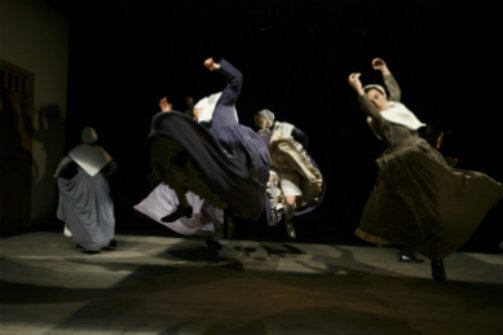 Angel Reapers is a non-traditional musical and dance piece which, ironically, reflects the original, revivalist spirit in which Shakers worshipped. Moments of song and dance very often begin from silence or subtle rocking, trembling, or soft, spoken prayer. Through the power of a community worshipping in synchronicity, these sounds evolve into powerful song and ignite into roiling, stomping movement. The songs are, in fact, based on original Shaker songs and are sung without musical accompaniment. The dance is an amalgam of ecstatic Shaker movement and modern dance. The resulting performance is an apt product of what Clarke describes as “stream of consciousness creating.” While the spoken text is not quite a linear narrative and not always straightforwardly understood, it complements the abstract language of dance which is the pulse behind Angel Reapers. The dance movement is beautiful, but the pas de deux pairings, which occur periodically throughout the piece, are exquisite. They evoke longing, confusion, and conflict which estranges these worshippers from their own humanness in the pursuit of a religious observance that negates some of the simplest human instincts for connection. A spirit of connection and collaboration is deftly depicted on stage in the performances as well as evoked in almost every component of the production’s other creative contributions. At the fore of my memory is Christopher Akerlind’s haunting lighting, Arthur Solari’s nuanced musical direction, and the clear, resounding voices of Sally Murphy as matriarch Mother Ann Lee and Nicholas Bruder as her younger brother William Lee. In an interview, Uhry describes Angel Reapers as “too out there” to be just a play. Perhaps that is precisely how it renders and resurrects a little-understood historical cross-section of life with such power and vitality. Angel Reapers is written by Martha Clarke and Alfred Uhry. Directed and choreographed by Martha Clarke. Scenic Design is by Marsha Ginsberg. Costume Design is by Donna Zakowska. Lighting Design is by Christopher Akerlind. Sound Design is by Samuel Crawford & Arthur Solari. Music Direction is by Arthur Solari. Production Stage Manager is B. Bales Karlin. The cast is Sophie Bortolussi, Nicholas Bruder, Asli Bulbul, Lindsey Dietz Marchant, Ingrid Kapteyn, Rico Lebron, Gabrielle Malone, Sally Murphy, Matty Oaks, Andrew Robinson, and yon tande.